Antibodies are widely recognized for their therapeutic potential and subsequently have prompted a lot of interest into their development and application. Progress in antibody engineering has led to the generation of many different types of antibodies that differ in size and shape, including bispecific antibodies. Bispecific antibodies are artificially designed molecules, capable of simultaneously binding two different antigens; hence, they can be applied to redirect effector cells to tumor cells. Currently, two large classes of bispecific antibodies have been developed: immunoglobulin-like and small bispecific antibodies. This review summarizes the various methods used to generate bispecific antibodies and discusses the perspectives and the therapeutic benefits of bispecific antibodies. Monoclonal antibodies (mAbs) have significantly advanced the treatment of a variety of human diseases, particularly the ability to treat cancer. The therapeutic use of monoclonal antibodies consists in activation of antibody-dependent cell-mediated cytotoxicity (ADCC), complement-dependent cytotoxicity (CDC), or engagement with cell surface receptors (to either activate or inhibit signaling) (Figure 1). Figure 1. Overview of the natural function of antibodies. Overview of the natural function of antibodies. 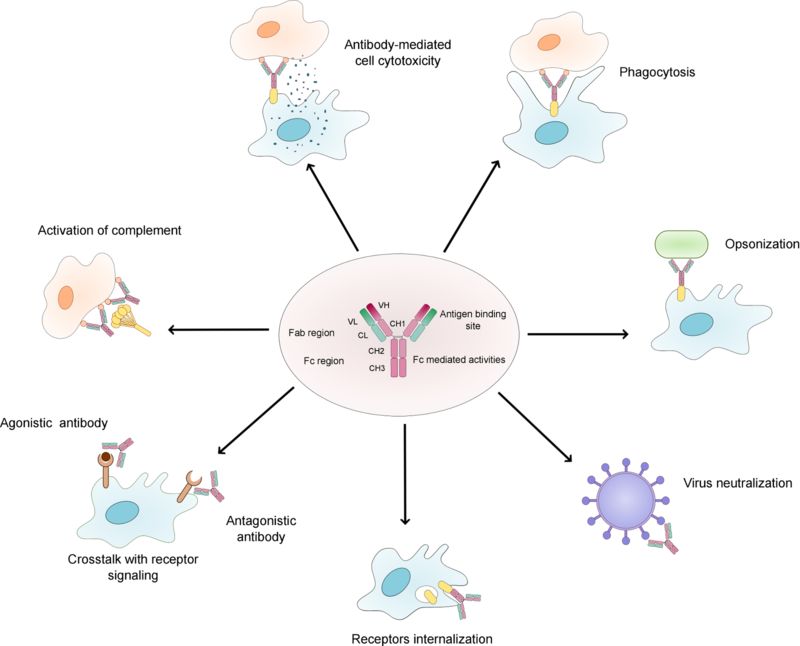 The figure shows the main functions of antibodies. The structure of monoclonal IgG antibody is represented, with the heavy chains in rose and the light chains in green. The constant domain is represented in bright colours and the variable domain in darker colours. Abbreviations: VL – variable domain of the light chain, VH – variable domain of the heavy chain, CL – constant domain of the light chain, CH – constant domain of the heavy chain, Fc – constant fragment, Fab – antigen binding fragment. Currently, most of the antibodies for therapeutic usage are monospecific, with a defined specificity for a particular molecular part of an antigen, known as an epitope. However, despite being the most widely used form of cancer immunotherapy, monoclonal antibodies have not been as successful as expected. Clinical studies have shown that many patients do not adequately respond to monospecific therapy, and often resistance to the treatment or tumor reemission has been observed. [2,3] This is perhaps not so surprising considering the fact that cancer is often a multifactorial disease, where tumors acquire a series of mutations. Further, many tumors rely on multiple and often redundant pathways of survival and proliferation, as well as crosstalk between signaling cascades. Therefore, aiming on a single target does not appear to be sufficient to destroy cancer cells. The need to improve their clinical efficacy has led to an increased interest in bispecific antibodies (bsAbs). Bispecific antibodies are proteins capable of simultaneously binding two different epitops, on the same or on different antigenes (Figure 2). By simultaneous recognition of two different targets, bsAbs can serve as mediators to redirections of immune effector cells, such as Natural Killers cells and T-cells, to tumor cells, in order to enhance their destruction. In addition, by targeting two different receptors in combination on the same cell, bsAbs can induce modifications of cell signaling, including the inactivation of proliferation or inflammatory pathways. Figure 2. Applications of bispecific IgG-like antibodies and their target molecules. Applications of bispecific IgG-like antibodies and their target molecules. Even though bispecific antibodies have similar characteristics as monoclonal antibodies, they remain an artificial molecule that can not be produced by normal B-cells. Bispecific antibodies can be obtained by different biochemical methods such as chemical conjugation of two antibodies, fusion of two antibody-producing cell lines, or genetic approaches resulting in recombinant bispecific antibody molecules. Currently, two major classes of bispecific antibodies have been described: Immunoglobuline-G (IgG)-like bsAbs and small bsAbs. The IgG-like bispecific antibodies have a conserved immunoglobulin constant domain, thus they can exhibit Fc-mediated activities. Although these antibodies share the same properties as conventional IgG antibodies, they differ in size and geometry. Therefore, a significant effort has been made to produce bsAbs with an IgG design that is as natural as possible. On the other hand, small bsAbs are genetically engineered recombinant antibodies lacking a constant domain. They have been primarily designed as effector cell recruiters, and unlike mAbs, T-cell engagers. Currently, more than twenty bispecific antibodies have entered clinical trials, and have opened the path to new and improved applications. This review summarizes the various techniques and methods to generate bispecific antibodies, reports new concepts developed for cancer immunotherapy, and discusses the perspectives of bispecific antibodies. The quadroma or hybrid hybridomas was the first approach used to create bispecific antibodies, when the idea for bispecific antibodies arose in the 1980s. The quadroma technology consists in constructing and producing bispecific antibodies by somatic fusion of two hybridoma cells (obtained by a somatic fusion of an antibody producing lymphocyte and a myeloma cell). Both hybridoma cells express monoclonal antibodies with different specificities, the ones desired for the bispecific antibody. The quadromas cell line from the two fused hybridomas secretes the two antibodies including the bispecific antibody with two distinct arms (Figure 3.A). [4,5] However, this method has not been adequate to produce bispecific antibodies in a quality and quantity required for therapeutic use, because of random chain association. The random pairing of the light and heavy Ig chains, resulted in less then 1/10 of functional bsAbs, hence, the bsAbs purification has been complicated. To overcome this chain association issue a chimeric quadroma was created from a murine and a rat hybridoma cell line. •. The chimeric quadroma expressing mouse IgG2a and rat IgG2b chimeric antibodies had three major technical improvements: (I) enrichment of functional bsAbs because of preferential intra-species heavy/light chain association; (II) efficient heterologous inter-species heavy chain association; (III) simple purification of the desired bsAbs with a specific affinity for a protein A and ion exchange chromatography. This method allows a better purification, and allows a large scale supply of bispecific antibodies •. Recently, an alternative redox method has been described as an improvement of the traditional quadroma method, in order to produce rapidly bispecific antibodies using the mild reducing agent 2-mercaptoethanesulfonic acid sodium salt (MESNA). During the oxidative reaction, a mixture of antibodies is produced, including bispecific antibodies and parental antibodies. The bsAbs are highly purified over two sequential affinity columns. The redox method can be used to produce bsAbs from mAbs of a different or the same subclass and the same species •. The bispecific antibodies obtained by the these methods have maintained the structure of conventional IgG antibodies. Despite being mouse/rat chimeric, the Fc part has retained the effector function, and therefore these antibodies have also been described as trifunctional or Triomabs®. The bsAbs produced by the methods above, have numerous potential clinical application, but the major drawback is the high immunogenicity due to the murine/rat nature. Nonetheless, in 2009, Catumaxomab (Removab®) became the first bispecific antibody approved for therapeutic usage in Europe. Catumaxomab is a hybrid murine/rat trifunctional bispecific antibody recognizing EpCAM (epithelial cell adhesion molecule) and CD3 (T-cell cluster of differentiation). It is used for intra-peritoneal treatment of malignant ascites in patients with EpCAM-positive carcinomas •. Figure 3. 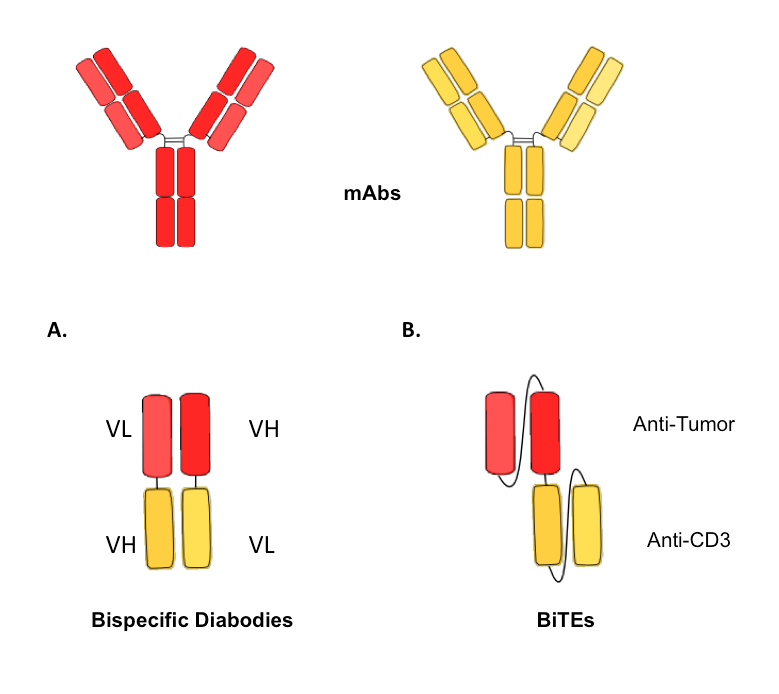 Schematic illustration of different formats of IgG-like bispecific antibodies. Schematic illustration of different formats of IgG-like bispecific antibodies. The parental monoclonal antibodies are represented above. (A) Heterodimeric functional bispecific antibody obtained with the Quadroma approach. (B) Bispecific antibody designed with the “Knobs-into-holes approach”. (C) Bispecific antibodies obtained with the CrossMab approach. The three possible formats are represented with different light chain domains crossover. (D) Dual-Variable-Domain immunoglobulin (DVD-Ig) bispecific antibody with two variable domains. While the heavy chain association is addressed by the methods discussed previously, it is also essential to impose correct light chain association. This is probably a bigger challenge from a structural point of view, since the modifications should be applied in the VL-CL / VH-CH1 interface, which requires more modifications. 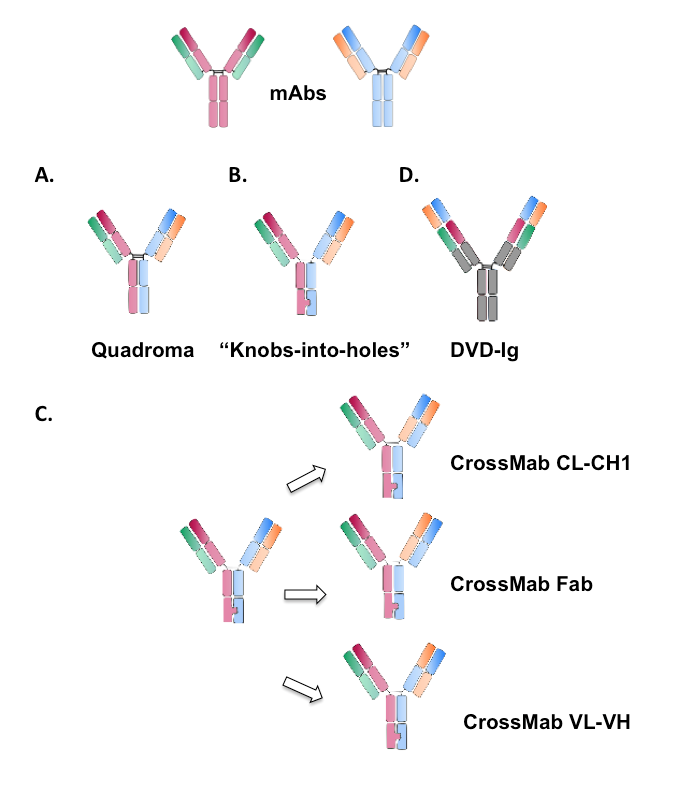 Recently, the CrossMab approach has been described as an option to ensure correct light chain association in bispecific IgG-like antibodies when combined with the “knobs-into-holes” approach. In this structure, one of the antibody's arms is untouched, whereas in the opposite hand the heavy and the light chain are modified. Three different modifications are proposed: (I) the whole Fab region; (II) the VL-VH region; (III) the CL-CH1 region (Figure 3.C) ••. Consequently, the modified light chain can no longer associate with the unmodified heavy chain; hence, the correct chain association is enforced. From the three suggested models, the CL-CH1 bsAbs showed the best profile and purity. Importantly, with the CrossMab method, there is no modification of the antigen-binding specificity, since the only difference from a conventional antibody is the connection to the Fc part. Using this approach, a bispecific antibody CrossMabCL-CH1 targeting VEGF-A and Ang-2 was designed. Such antibodies are intended to block the ligand–receptor interactions VEGF-A/VEGF receptor 2 and Ang-2/Tunica internal endothelial cell kinase 2 (TIE-2), respectively. This antibody exhibits potent antitumoral and antiangiogenic effects, making it a promising bsAbs for therapeutic applications in cancer therapy and other diseases in which angiogenesis plays a role ••. Antibody genetic engineering has led to a production of various antibody fragments differing in size, design and pharmacokinetics, and yet retaining the antigen-binding properties of full-length molecules. Diabodies are group of small bispecific antibodies generated with DNA recombinant technology, which consist of two VH and VL domains of two different antibodies. In this design, each VL domain is cross-linked via short peptide linkers with the VH domain of the other antibody (Figure 4.A). Since, chains from the same antibody tend to dimerize when co-expressed in the same cell, the production of bispecific diabodies requires the following arrangements: VHA-VLB and VHB-VLA (VH-VL configuration) or VLA-VHB and VLB-VHA (VL-VH configuration). Moreover, the linker should be of small size (five amino acids), positioned between the VH and VL domaines in a way that these domaines will be forced to associate with the complementary domains of the second antibody. Thus, a diabody is created with two antigen-binding sites. By overexpression of VH-VL fused domains in bacteria (E. Coli), soluble diabodies can be produced •. Figure 4. Schematic illustration of different formats of small bispecific antibodies, containing only the variable domains. Schematic illustration of different formats of small bispecific antibodies, containing only the variable domains. The parental monoclonal antibodies are represented above, with the heavy chains in dark colors and the light chains in bright colors. (A) Bispecific diabody with the VH-VL configuration and illustration of the short linker. (B) Bispecific T-cell engager antibodies (BiTEs), with the two different antigen-binging sites anti-CD3 and anti-tumor-related target structure. The concept of using bispecific antibodies for cancer immunotherapies was conceived more than 20 years ago, when it became apparent that single targeting is often insufficient to enhance tumor cells destruction. However, the initial clinical studies with bispecific antibodies were rather disappointing due to the low efficacy, stability and immunogenicity. The deeper understanding in cell biology and immunology and the concomitant development of antibody engineering led to the production of new classes of bispecific antibodies with better pharmacokinetic properties. The major issue that has been overcome in these past few years have been the ability to produce pure product on a large scale - sufficient for clinical testing, and with good drug-like properties and stability. Nonetheless, immunogenicity remains an important issue to be resolved. Regarding the IgG-like bispecific antibodies, having an arrangement that is as close as possible to conventional IgG antibodies with less linker or additional domains, is desirable. Obtaining a closer traditional IgG format should also decrease any possible secondary adverse effects. Although IgG-like bsAbs exhibit appropriate stability and effector functions, their large size limits tissue penetration. On the contrary, small bispecific antibodies have more efficient penetration, due to their small size. This advantage can be applied in the treatment of solid tumors. However, the small specific antibodies exhibit short half-life, and therefore further work needs to be done to increase their serum half-life •. With the advances in genetic engineering, bispecific antibodies have experienced a revival and regained the attention of the biopharmaceutical industry. The current engineering methods have yielded over twenty bispecific antibodies in clinical trails and only one has been approved for cancer immunotherapies. The majority of the bispecific antibodies in clinical trials are Triomabs or small BiTEs. Most of the developed bispecific antibodies in clinical trial have very efficient anti-cancer effect, and are promising to receive the FDA approval ••. The main interest in bispecific antibodies is due to their potential to engage immune effector cells, such as NK-cells and T-cells, to promote tumor cell destruction. T-cells are known to play a key role in the immunosurveillance and antitumor immunity, thus their engagement is essential in cancer immunotherapies. This is an important advantage of bispecific antibodies over classical IgG antibodies, since T-cells do not possess a Fc receptors and they can not be recruited by mAbs. [29,30] Further advantage of bispecific antibodies over monoclonal antibodies is blocking two pathways in parallel to impair resistance formation (for example, receptors tyrosine kinases and angiogenic ligands). Given this encouraging clinical data, ameliorations in the design and the efficacy of therapeutic bispecific antibodies is likely to continue with rapidly. This review shows the significant progress that has been made in bispecific antibodies engineering and their therapeutic potential. While many challenges remain, these antibodies have promising clinical applications, especially in cancer immunotherapies. Targeting two antigenes simultaneously is a promising approach in blocking tumor latent escape pathways from single target inhibition. However, to completely seize the therapeutic potential of bispecific antibodies, a lot of work is required to manage the increased complexity involved in their design. I thank Charles Dumontet, Minh Ngoc Duong, Laurent Viriot and Petar Filipov for their help and their advices concerning this review. ● The autors of this study report improvements in classical Quadroma approach by using antibodies from different species. This method allows to overcome the random chain association. ● This study report an improvement of the traditional quadroma approach, that allows to produce bispecific antibodies in large scales, and easy to purify. ● This study reports the structure and the trifunctional features of Catumaxomab, the first bispecific antibody for cancer immunotherapie. ●● This study characterizes a new method that facilitates the production of bispecific antibodies. It is revolutionary methods, used in many others techniques. ●● This study reports a new method to assemble correctly the heaves and lights chains of bispecific antibodies. ●● This article reports a new formate of bispecific antibodies with two variable domains. It shows that antigen binding site can function independently without posing significant steric hindrance. 16. Gu J, Ghayur T: Chapter two - Generation of dual-variable-domain immunoglobulin molecules for dual-specific targeting [Internet] . In Methods in Enzymology . Edited by K. Dane Wittrup and Gregory L. Verdine. Academic Press; 2012:25–41. 18. Tarcsa E, Fraunhofer W, Ghayur T, Salfeld J, Gu J: Dual-Variable Domain Immunoglobulin (DVD-IgTM) technology: A Versatile, novel format for the next generation of dual-targeting biologics [Internet] . In Bispecific Antibodies . Edited by Kontermann RE. Springer Berlin Heidelberg; 2011:171–185. 21. Hornig N, Färber-Schwarz A: Production of bispecific antibodies: Diabodies and tandem scFv [Internet] . In Antibody Engineering . Edited by Chames P. Humana Press; 2012:713–727. ● This chapter reports the advances in the production of diabodies, their structure and therapeutic potential. ●● This review describes the mechanism of BiTes action and its potential therapeutic applications. ● This review shows the current state of immunotherapies with monoclonal and bispecific antibodies. ●● This review describes recent advances the production of bispecific antibodies, and describes the bsAbs currently in clinical trials. 33. Nettelbeck DM: Bispecific antibodies and gene therapy [Internet] . In Bispecific Antibodies . Edited by Kontermann RE. Springer Berlin Heidelberg; 2011:327–347. 34. Parashar A, Sarkar S, Ganguly A, Sharma SK, Suresh MR: Bispecific antibodies for diagnostic applications [Internet] . In Bispecific Antibodies . Edited by Kontermann RE. Springer Berlin Heidelberg; 2011:349–367. 35. Kontermann RE: Bispecific antibodies: Developments and current perspectives [Internet] . In Bispecific Antibodies . Edited by Kontermann RE. Springer Berlin Heidelberg; 2011:1–28.